HELLO!!!!! I don’t know if you have missed me, but I have certainly missed you! Although I indulged in an extended Christmas/New Year break from publishing on my blog, I certainly haven’t neglected blogging. Have you noticed the address? Welcome to my new blog!!! My very own .com! I feel so grown up! The lovely Tanya at Blogelina did a wonderful job helping me out. I highly recommend her Blogger to WordPress transfer and design transfer. I’ve been wanting to do this for a long time, but I barely have time to write this blog let alone to learn how to do all this behind the scenes technical stuff. Everywhere I had searched previously told me that to do this would cost more money than our family budget could stretch. It was such a blessing that Blogelina had such affordable prices. So 2015 has begun with the same blog under a new domain name. I’m still learning how to work in WordPress, but as I do, I am quietly hopeful that my dreams for this blog continue to come true. Firstly I’m hoping that I can find set times and become more regular in my contributions. I still have ideas whirring in my mind on how this blog can be an encouragement, inspiration and help to you. Please don’t be shy, let me know what you love and what you would like to hear more of on this space. Maybe we can both help one another! Don’t you love a new year? It is bright and shiny and just beckoning for you to enter and soar to new heights. I am feeling very optimistic about 2015. After all it’s my 40th year of life, that certainly is momentous! I should add that I will not turn 40 until the end of November so I for most of this year I am certainly still in my 30’s! However, I love a party, and when you are a grown up it takes a decade before you are justified kicking your heels up and having a great shing ding. I’m already speculating what we will do, I’ve got ideas but no plans yet. Plenty of time for that. I have resolutions racing around in my head. I want to get them down onto paper. To make them real. And include an action plan. So that they will happen. I have started the process. I didn’t want to write it all out on January 1. I want to be careful and considered so that my goals are realistic and achievable. We were away on holidays at Bargara. I had been getting up early and walking along the coastline, at the end of the walk I sat down at a picnic bench and while the sea breeze blew I started writing my plan. It felt good. I need to continue because the storm clouds gathered and as the rain started to spill I raced back to my family eating their breakfast and bickering over who got to sit in the ‘best’ seat. Some years I don’t write resolutions because it feels so cliche and I don’t want to write something I will fail at. Because that’s what you keep hearing, that most people don’t follow through with their resolutions. To be truthful, I do succeed sometimes, and then there are failures. This year I’m setting many goals, but I want them to make differences in my life and for those I love. Many of my goals are the simple things. Because there are plenty of simple things I can improve on that will make a huge difference in my life and for my family. I have goals for my family, organising my home, my spiritual walk and my blog. We welcomed the New Year with friends. We sat on the balcony across from the ocean (we couldn’t quite see the sea) and ate seafood and sipped champagne. Earlier we had cooked fish and chips for the children. It had taken a bit too long doing this, so we missed watching the fireworks on the beach like we had planned, but the kids watched them from the car as we drove closer to them. Whoops! We then turned around and let them play with the sparklers on the deck before getting tucked in for bed. Then we sat on the deck and chatted until midnight. After midnight we said a prayer blessing the New Year before heading to bed. Another New Year with my love. It was stinking hot and the humidity sky high in Bargara and the a/c was broken. Hence the shiny skin, no make up because it’s slid away and frizzy hair! We thoroughly enjoyed our holiday. Cycling by the seaside (Alex and the kids cycled, I walked the dog!). Ice cream breaks and hanging out with friends. Sunshine and swimming in the beach. And all too soon, it’s back to reality. Although there is something about returning home from holidays in a new year. That sense that the holiday is over and the anticipation that real stuff is about to begin. Somehow the new year has brought a feeling of restoration. 2014 was a challenging year for us and contained hurt from people we trusted and heartache from things beyond our control. I felt disheveled and limped over the finish line. I was praying for this New Year and felt my word for this year is “New Beginnings”. I am believing that God can make all things new again and can sense there is fresh hope in this New Year so I am taking a deep breath in and looking forward with optimism. I don’t think that it is going to be an easy year. Already there are dark shapes looming in the distance that I know will take courage and perseverance to pass them by. But come the end of 2015, I know I will be a stronger person (even though I will be 40. Sigh.) and have learnt lessons that will continue shape my impact on my corner of the globe. Anyway, I’m getting deep and philosophical. Enough about me. So tell me, how was your Christmas and New Year? I would really love to know? How are you feeling about the new year that stretches before you? Do have goals, words or impressions of what this will be for you? Talking of which, I love Grace’s post about her Year of Small Things. Make sure you check it out. Kind of sums up life for me now. Because small things are often the big things in life. Elf on the Shelf – Easy Peasy Ideas! During December, we really had so much fun with Elvey. Mind you, I wasn’t always creative with his placement, (Hello! I had two year old triplets!) There was some mornings that I was secretly hiding the elf behind my back and scampering through the house to shove the elf in a new spot for the day. Thanks to the innocence of childhood, my children were delighted to see him even if he was doing nothing exciting, the thrill of finding him was enough for them. Exhibit A & B below! Trent discovering The Elf on the Shelf was hanging from the fan. Jonty looking at the elf simply sitting on a shelf! Elf on the Shelf Hanging Underwear from the Ceiling Fan. Oh yeah. That cheeky elf looked very comfy hanging in the kids pants. Trent was a little disgruntled, but happily saw the joke eventually. Sitting on a Shelf With Candy Canes looking Christmassy. Hanging Out in the Bathroom and Plastering the place with Bows. This was actually more complex then I expected! The bows just would not stay on and were dropping off everywhere! By the morning there was basically a pile of gift bows on the bench top. Elvey was hanging on the shower screen, but kindly offered the children the candy canes for a Christmas snack. He also left a letter giving them some feedback! Luckily the boys thought it was cool! Hanging out with the Nativity crowd. Getting spicy in the spice rack. It took forever for the boys to find the elf this day, and the needed some substantial clues before they could locate him. Another example of how simplicity did not disappoint. I gave my sister the honours of elf placement one night when she was visiting and this was what he ended up doing. Turns out even elves can get sucked in by Woolworths brilliant marketing ploy. Once more Elvey is on a shelf. This time hanging with the owls. Last year I bought these gorgeous white reindeer from Coles. Elvey loved the little guys as well. Must have made him homesick for the reindeer back at the North Pole. So he fed them carrots. This was actually my favourite elf position that I did, even though the poor little guy needed to be roped in as well. It can be hazardous hanging on to a carrot that is more than your body weight. Another morning Elvey was riding the reindeer. As you can see, the boys thought this was funny. It seems that scout elves often end up creating mischief in the toilet. Trent was aghast. Personally, I would not be hanging out in our loo if I were an elf. Trust me. Little boys have bad aim. Our WC is not always a pleasant place to be. In any case, The Elf on the Shelf was a lot of fun for our family last year and I’m looking at finding more places for Elvey to hide this year. It will be more fun for the triplets this year also I think. I’ve got a Pinterest Board full of ideas of where Elvey can hang out – but would love to hear a suggestion if you have one! Have you heard of Elf on the Shelf? Do you have a scout elf at your home or do something similar? Are your kids starting to catch the Christmas spirit yet? Easterfest 2014 is all over. If you missed it, watch below for an action packed re-cap. I’m not sure whether to be sad or a little bit relieved. Sad because Easterfest is a fantastic festival, great artists, so many things to do and fun. But I am relieved we didn’t go today, because as much fun as it was, gosh it was so tiring doing it with five kids under seven – and in particular, you guessed it, the three two year old triplets. When we were home from the festival, the triplets did sleep well, let me assure you! Alex and I my parenting strategy is just to get in and do things and deal with the fallout afterwards. So Easter Monday was officially devoted to going slow and recovering. Don’t tell the triplets, but because they were fully zonked out and taking an extra long nap, they have missed out on a post Easter egg hunt with some friends at a local park. The big boys were happy to go along though – not that any of them needs extra sugar, but that’s another story. Talking of which, sugar is exactly the way Easter Sunday began, with Trent, our living alarm clock, running in and letting us know that the Easter Bunny had came! He then specifically came over to me and made a point of saying, “The Easter Bunny has given me chocolates, not you. Just the Easter Bunny.” We tell him every year that the Easter Bunny and Santa aren’t real. (Just our choice, no problem with those who don’t) It doesn’t matter. He simply refuses to believe me. At least he can never say I lied! Little did he know that after coming in late from a watching the jazz at Easterfest, (See ) I had stayed up late not only filling their Easter buckets with chocolate, but also loading a new game onto their leapsters/leap pad so they had something to distract them at the concert on Sunday night. The triplets normally are locked in their bedroom in the mornings. (On account of their super powers of destruction if they get up before us.) I didn’t trust them enough to leave chocolate in their room with no supervision. They were pretty happy to find the buckets at the door when they woke up! Of course there was chocolate for breakfast. There’s only one day of the year you can get away with chocolate for brekky! Anyway, onto Easterfest. We headed to Mainstage for the church service. As usual it was a brilliant time of corporate praise and worship. Our church traditionally runs the Easterfest service, and there is always a big crowd from Easterfesters and particularly the campers. We were so proud of one of our great pastor’s Nat Spary preaching the sermon. Nat shared his testimony about growing up in a dysfunctional home. He was so poor “that we couldn’t afford the R in poor and that just left us with poo.” Because of the Resurrection that we were celebrating on Sunday, Jesus has set him free from a life of hurt, pain and addictions. He learned that God’s love had the power to heal and to save. These days Nat runs an awesome ministry called The Base which ministers to the poor and disadvantaged, to kids who are in a similar situation to him. This is Nat and his incredible wife Tiff. I had run into them in Kidsworld the previous day! After church we went home and settled some very tired triplets down for a sleep. The big boys and Daddy kicked back and watched a DVD, so I took advantage of the peacefulness and escaped back into town to watch Jars of Clay at “The Palace” (tent!) It was so nice just being out on my own and enjoying the music. I had to run away a bit early, but I couldn’t resist ducking in to have a quick look at the Lifeline tent after hearing such great things about it. I picked up a cute shirt and dress, complete bargains. Yay! Once I was home I discovered the triplets were still sleeping, (they clocked up a three hour nap, thanks to Easterfest exhaustion!) so I raced madly around the house packing things, particularly warm clothes, (Toowoomba is chilly at this time of year), so we could go out as a family to the final event on MainStage. We were a bit nervous about how we would go with all the kids. As always, we decided to plunge in and just do it. We always have an “Abort Mission” clause that we’ve agreed to if things aren’t going well. A few times, a very few at that, we’ve aborted missions. But for the most part we find that we get through things, and we would prefer to be doing stuff rather than sitting safely at home and missing out on the fun. Minus one child in the pic Sunday night. Dami Im was brilliant. I loved seeing how genuine and passionate she is about her faith, and she really has the Wow factor as well as the X factor when she belts out a tune! I was so impressed with how the OC Supertones worked the crowd. They had everyone up on their feet and participating. Even my kids listened and obeyed! (I wonder if they do house calls) As the kids danced around, raised their hands and clapped to the songs, I was so glad that we made the effort to come as a family. A presentation by the crew from Yes He Is was truly inspiring. New Empire also rocked the stage. Towards the end of the set, it was apparent that it was time to take the kids home. It would have been good to stay for the Worship Party finale, but this is just the stage of life we are at. Altogether, I am very grateful that the organisers of Easterfest giving us tickets. It has been a pleasure to share with you about this well organised, fun, inspirational festival that is full of talent, passion and faith. To be honest, it hasn’t been easy taking five kids to the festival every day. We were absolutely exhausted by the end. There are a lot of moments I just wanted to give up. When we came home at lunchtime I felt like bawling while the kids were all crying, I had a sore back, I was tired and I was worried because our dog had run away since Friday night, (Thankfully our neighbours on the other side of the highway found him at their place when they returned from camping.) But after a little sniffle (such self control!) I just pulled my big girl pants up, thanked my God for my blessings and kept pedalling like mad, because it’s a glorious ride this life and I want to make the most of it! Just to remind you as I say this, I’m under no obligation to say anything but my own opinions here. Easterfest hasn’t sponsored these posts or all my social media contributions over the weekend. I just really want to heartily endorse and recommend Easterfest as a great event for people to go to. As a family, we had a blast. Sure we don’t get to do as much as we might like, but everything we did do was awesome. (Cue Lego theme song… Everything is AWESOME!!!) Kidsworld was so good at keeping the younger ones engaged, it may not feel you are getting value for money when you are stuck in the sandpit, but like my sister said as she hung out with me there on Saturday, “I come here when the kids are young because I want to support this festival in the hope that it will still be here when my kids are teenagers.” Her family got a one day pass, but her 11 year old eldest daughter loved it so much her and her father came on Sunday as well. For families, if you have kids who are in their pre-teen and teenage years, I think they are the ideal age to enjoy the full benefits and value of the wide range of music available. Of course it’s ideal for young adults as well if we are talking more than families, but everywhere I looked there was people of every age group. There were a lot of grandparents sitting up the back with us at MainStage also, and they certainly looked like they were enjoying themselves even if their mosh pit days are over! The big announcement of the festival was that Switchfoot will be there in 2015. The news hot of the press is that until April 30 you can get discounted tickets online for 2015, so it’s definitely worth checking out, or letting someone know if you think they will enjoy it. Hop over to the Easterfest and click on the tickets button. But in the meantime, I loved it, but it’s time to take off the festival wrist wear and get on living the life that glorifies that God we spent the weekend proclaiming. Easterfest 2014 is a good one. The children particularly have had an absolute blast! Kids World is amazing! To be truthful, I haven’t even scratched the surface of what’s there, but hey, that’s to be expected if you take 5 kids to a music festival – especially when said festival caters for the kiddos so well. You’re bound to stay in that corner! The Accountant was very adamant that the lawn needed to be mowed this morning. It rained while we were away, so the grass was long. He did have a point. After all, I didn’t want tigers that have hidden in the grassy pasture of our backyard jumping out of the long tufts and devouring our children. And so he was out on the ride-on this morning, doing the obligatory rides for each child. Thankfully, once each child had their turn, he was happy to give it a break since the lawn was heavy with dew this morning, so it wasn’t easy to cut. So, we headed into Easterfest. Perfect timing really, we got to line up with my bestie Belinda from BBeingCool. Belinda has crutches at the moment because she had an ankle re-construction. The poor thing had to explain this repeatedly throughout the day, and I suppose she will be explaining the whole time she sports a moon boot – which she wore with flair, I might add! Because she is such a lovely person, there was no pretence she didn’t know us while our children dropped to the ground repeatedly and did their toddler thing. Once we got our tickets (Thanks Easterfest! *) We had to deal with the toddler fallout. The two year old identicals did not approve AT ALL to having ‘bracelets’ put on. Mammoth two year old tantrum was thrown. You know the type where everyone turns to see what the heck is happening. We made it as quickly as possible over to Kids World. The boys didn’t want to be distracted from their very important tantrum, but within three minutes they gave in. Honestly, resistance was futile with the myriads of exciting activities therewithin! At that point I blew The Accountant a kiss and raced down to “The Forum” to listen to Nanalew, Meekakitty, (awesome you tubers, search them, so cute!) and the dude behind yesHeis (can’t remember his name, but he was seriously inspiring) and our very own Toowoomba blogger, The Crafty Mummy. After that finished, I returned to Kids World. The Accountant was slightly frazzled, but still in control. Seriously, my husband is a legend. I know for a fact that there are many Dads who wouldn’t stay on their own with five kids for an hour and a half in a public place. Or Mums for that matter, to tell you the truth the thought scares even me. Alex ran out for a little bit for a look around, and I was very grateful the kids were happy eating some lunch and watching the SU chaplains run a SUPA club. It was so good seeing the kids engage with the Gospel message. After SUPA club, we did a few more fun things like play in the giant sand pit, merry-go-round, pirate boat rides, knock-it-down games, petting zoo and a giant shark slide. Oh, and I shouldn’t fail to mention, we met Bob the Tomato and Larry the Cucumber! Christian vegetable royalty! I hadn’t noticed the duo at first. Toby kept pointing and saying, “Look!” I finally noticed that he was pointing to a person dressed as a tomato. I just commented, “Oh yes, a big tomato.” I thought it was really random that they decided to have a tomato walking around the grounds when there was a pirate theme! (In my defence, Bob was standing side on and I couldn’t see his eyes!) The boys kept getting excited and watching the tomato. Then Larry walked out and I finally got it! Then the big boys saw his and joined in. Having grown up on a cucumber farm, I have soft spot for good ol’ Larry. him into the stroller. Unfortunately the mega you tubers were right next to us conducting an interview on camera. I don’t know why they decided to interview them in Kids World – although I’m glad they did, while they were waiting for the interview to begin, I had a chat with them while I was in the petting zoo. Nothing like shaking the hand of a famous You Tuber with around a million subscribers while a goat is pooping next to you. (The goat had no social graces.) Anyway, to leave we wheeled a screaming two year old through the crowd and went home. Hung clothes on the line, had fish for dinner, put tired triplets to bed, read a devotional with the big boys and said some prayers remembering Christ’s sacrifice on this Good Friday. Meanwhile I’ve been sitting here looking at all the #easterfest2014 hashtags on Facebook, Twitter and Instagram and reflecting how awesome this event is. If you live in Toowoomba, or even nearby, seriously it’s not too much of a drive for those who live in Brisbane and other nearby South East Queensland areas, you really should consider making a spontaneous decision and coming, you can buy a one day ticket at the gate. I’m going to indulge in a little editorial at this point. The tickets aren’t cheap. Especially for families. Some of you really couldn’t afford it, and I get that. There have been years that we have not come because of the money also. However, if you do have the funds, consider coming if for nothing else to support the cause. Because how seriously awesome is it that there is an Easter event in Toowoomba, in Queensland, in Australia (because this is the biggest Christian music festival in Australia) that there is an event that proclaims God’s name into the supernatural realm of our town/state/country? It is the type of stuff that by just by the amount of worship that comes out of this event, darkness is pierced. You might have a family like ours, or be an older couple. I get it that you don’t want to spend all that money to sit in Kidsworld or don’t have a connection with the majority of the artists. But can I encourage you, your children pick up something of that spiritual dimension just by being in the place. You will pick something up. Just being here allows God to work in your spirit. Just coming is stating that as a family, we support this cause because we want God’s name proclaimed. The reason Easterfest tickets do cost so much money is there is soooo much funds that are required to run a festival of this magnitude. If you’re just not into this type of thing so you think that it is not value for money, think of it as a donation and think of the value this event is to our nation. If you have tweens or teens, it is excellent value on all accounts. This is absolutely quality music and a super fun venue. So stay tuned to my Facebook, Twitter and Instagram accounts as I track our movements at Easterfest 2014. We are feeling the Crazy Love**! Jars of Clay playing at the concert I missed out on tonight. (sniff, sniff) Glad that Alex is enjoying it! Photo taken from Easterfest’s Facebook page. Are you at, or have been to Easterfest? Favourite moments there? What type of music is your type? * Easterfest gifted a family pass to us, and another pass as a giveaway. But everything I have shared about the event is my honest opinion. Because a liar liar pants on fire is something I’m not. ** This years theme for the event! I haven’t shared many photos of my husband’s 40th birthday party, so I thought it would be a good chance to this Wordless Wednesday. If you want to read a few details on how and what we did, head to my post about Planning a Milestone Birthday Party. But here is the night in pictorial detail. The Birthday boy and the whopping big gawdy badge my sister put on him. I wasn’t very impressed at all when I turned around and saw him wearing that. I’m already finding something incredibly tacky for her to wear on her 40th in several years time. Except I wouldn’t be that nasty. The triplets were ready to eat the bonbonneires (giant freckles) well before dinner was on the table. Alex with his family and Toby. His Mum, Dad and sister. How boys keep themselves amused at parties in the iPad age. Toby and Imogen packing up at the end of the evening. Oh yeah, she knows how to work a camera! Immy had her entrance, Toby had his exit. 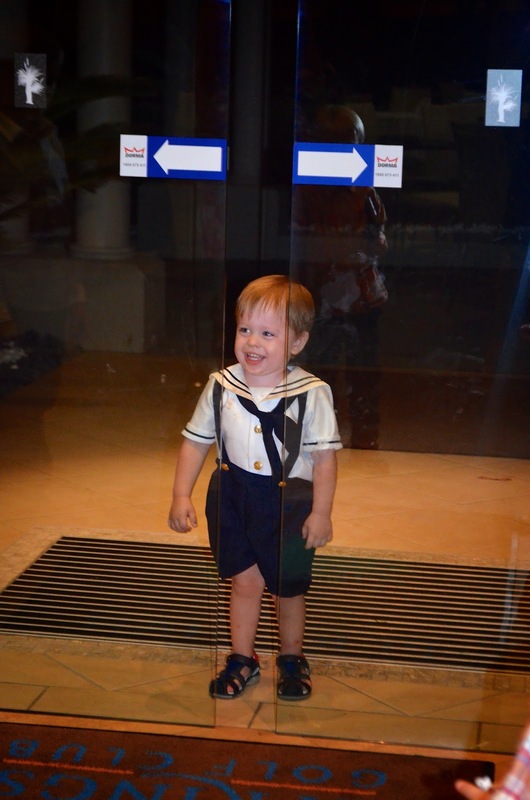 At the end of the night, he stood at the automatic doors and giggled hysterically at them opening and closing. My beloved and I at the end of a lovely evening. Can a two year old worship God? I stood in the pew. The music soaked into my soul but all the while my attention was split between the corporate singing and being mindful of the little bodies squished around me. Those little bodies don’t ever stay still during waking hours and church is no exception. And neither should it be. The old tradition of sitting still in the pew in fear and trembling, not able to move all the while uncomfortable in stiffly starched clothes are mostly gone. The church now is an inviting place and my children enjoy coming into our Spiritual home on a Sunday morning. Why would they not? They have friends to play with and adults who indulge them and give them attention and love. There are formalities, but when the talking gets interesting for adults but boring for young minds, they are able to disperse to various locations that cater for their age group and have fun, play games and all the while learning about a faith that embraces their innocence and nourishes their spirit. And at the start of church, there is music. There are hymns, (not played on an organ though) but mostly we sing songs about our God that have been composed in accordance of contemporary rhythms, melodies and strong beats. While the band plays these tunes and people join and sing enthusiastically all around, my Toby worships. For three Sundays now I have particularly watched his involvement. Treasuring his enthusiasm in my heart in the way only a mother can. His favourite position to worship is standing on the back of the seat in front of him and leaning against an adult. Toby is easy going and will be held by different people on a Sunday morning. Jayden, despite his tendency to be social, is being snobbish right now and making a point of clinging only to Daddy whenever he can. But that is another story. The child in front of me continues to bop up and down, up and down. His funny little dance. This is my child who has limited concentration skills. Normally he would have lost interest. “You are Lord, you are Lord. All creation will proclaim. You are here, you are here. In your presence I’m made whole.” The song continues. The worship ended, the service was concluded, the week progressed. The toddler was a toddler. There were giggles and laughter, tantrums and tears, cuddles and snuggles. And then we were back in church. The music played and this time as Toby stood with me, once again perched on the pew in front, he swayed to the music. And swayed and swayed. He was worshipping again. In toddler style, doing what felt right at that moment. Today, another Sunday, he stared and stared at the band. And then he started pointing the instruments after examining each person playing their craft. And then, probably copying those around him, but nevertheless in an expression of his contribution to the worship, he raised his little hand and kept it raised all while humming tunelessly. for. It doesn’t matter if their worship lasts for two, five or ten minutes. It is them expressing themselves at the level they are at. No one is too young to connect with God. Because that’s the way God designed us. Mortal beings with need for an Immortal connection. Toby, my darling. Always stay connected. Always worship. May your life give Glory to Him. Valentines Day is a great chance for family’s to show their love to one another. In Australia, the popularity of Valentines Day is growing. When I was a child, there were flowers available in the shops, (Thank goodness, because my Dad was farming flowers for quite a few years during my childhood! Valentines Day was good for business. ), but certainly only a certain number of people would give flowers or exchange cards. However, we do have a tendency to follow the traditions made popular in the US, (especially when the shopping centres realise the commercial lucrativeness of these special days), and now, like many places in the world, the shops are overflowing with Valentine opportunities and it’s not an easily forgotten day anymore. When I was a girl, I loved seeing all our flowers picked, and ready to be delivered to the florist – roses, carnations and babies breath. (It was the 80’s after all). I used to dream of a man giving me flowers and showering me with gifts on Valentines Day. Luckily for me, The Accountant has used Valentines Day to display his love to me – it always makes me feel warm and fuzzy. A girlhood dream come true is very satisfying. For those who accuse Valentines Day of being purely commercial. I don’t care. If it takes a commercial prompt to remind people to express their love, I’ll take it! Gladly. Alex had left for an early morning meeting this Valentines Day so woke me with a kiss and a Happy Valentines Day wish. It was a little thrill to find his card later in the day, and I must say I did a little happy dance when I read that he has some Royal Doulton I have been desiring on its way. Bit surprise, because I’ve enrolled in a painting class, and he had told me that was to be my Valentines gift. Spoilt to the max! My fancy candle and massage oil for him, seemed a little insignificant, but I made it up to him. 😉 Say no more! Excitedly unpacking the beautiful mugs and plates once they arrived. From what I have observed over the internet, the Americans, (and probably other countries also, but Americans are most easily ‘seen’), celebrate Valentines Day with their children also, with class gifts and exchanging Valentines mail and craft activities. While I don’t think that children should be pressured to be romantic with one another, (there is plenty of time for that later in life), I do think Valentines Day is a great opportunity to teach children about the depth and meaning of love. So, in our house, we celebrate Valentines Day. At this stage I follow a simple formula. Bake some Valentines snacks, do Valentines craft and have a special dinner together. It’s very easy to bake some biscuits, ice them and let the children decorate them. This year, we cut them with heart shaped cookie cutters and decorated with pink sugar balls, raspberry M&M’s and lots of sprinkles. Using a toilet roll that was folded into a heart shape and a cookie cutter, the children did printing with red and pink paint onto cardboard. We made cards and placemats, to be used later that evening at dinner. It’s a shame I don’t own a laminator. (Perhaps one day soon.) Laminating the placemats would have meant we could have used them for the next week at least. But unfortunately they were a one hit wonder! But it all added to the atmosphere of family love! Trent didn’t want to paint, but he did cut out paint chip samples into hearts and stripes to make cards. He had also seen Mr Potato on TV that morning when watching Peppa Pig. He wanted to make Mr. Potato, but I suggested Mr Heart Head instead. I thought his Mr. Heart Head turned out very cute! Of course, dinner, even though eaten with gusto, had it’s typical insanity. Life with four children under four, particularly the three two year olds, means that love is not demonstrated in peaceful whispers and silent meaningful moments. Although there are still loving family moments. Like holding hands to say grace together. And that was our simple, but loving Valentines Day. I spoke a lot to the children about love and doing things for one another to show love. Of course it’s very simple at this age, but I fully intend to continue to bulk it out as the kids grow older. Having four boys, I think it’s important they grow up being able to express their love for others. I also want my girl to expect the male in her life to treat her with love and respect. Valentines Day is a great training day for future life and a day where children feel secure in the immense love that a family gives.